Domainers trust us with their most valuable assets. Consolidating your portfolio with Uniregistry can save you time and money. Our Portfolio Management system was specifically designed to handle large-scale domain portfolios. Drag and drop domain and portfolio functionality, along with the most advanced bulk search, and registration capabilities allow you to organize your portfolio like never before. Industry veterans may be familiar with DomainNameSales, the leading platform for premium domain sales and monetization. If you already have a DNS account, you can now link it with your Uniregistry account to provide easier portfolio management, transfers, tracking, and more. Protect your portfolio and save money with free WHOIS privacy by Privacy.Link™. Uniregistry is built on a 'no upselling' model, and we believe you shouldn’t have to pay to control your personal information. Don't want to transfer all your names at once? Just paid renewal and don't want to leave money on the table? We can automatically transfer your names from any registrar when they’re near the renewal date. Your personal Uniregistry representative can work with you to develop a consolidation plan, and even run your transfers for you—saving you time and money. Our Document Upload System allows you to organize your portfolio like never before. 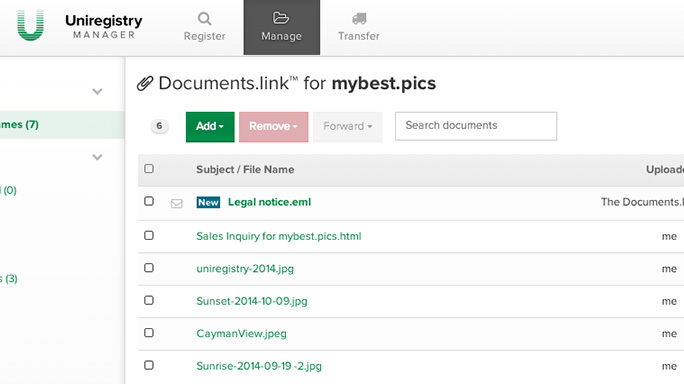 From domain inquiries and notices, to pictures and video files, you can easily upload and manage any documents you want and connect them to specific domain names in your account. Are you a large portfolio holder considering a switch to Uniregistry? We're here to help. Speak to a member of our sales team right now to discuss your custom bulk pricing options, and to develop a transfer consolidation strategy.